I made a couple of changes for the living doll's tunic. I shortened the sleeves to three-quarter length as requested, and created a facing for the neckline. 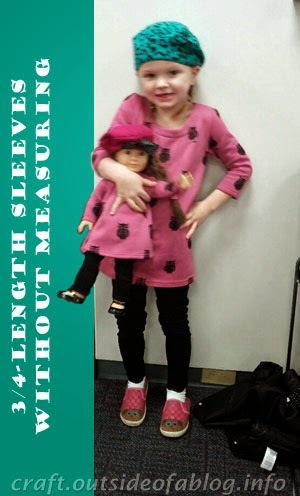 To get a 3/4-length sleeve, I began with the long sleeve pattern. I folded it so that the hem edge of the sleeve was even with the notches that mark where the underarm turns to become the sleeve cap. Then fold the hem edge down to meet the fold you just made. Finally, open the first fold keeping the second fold intact. 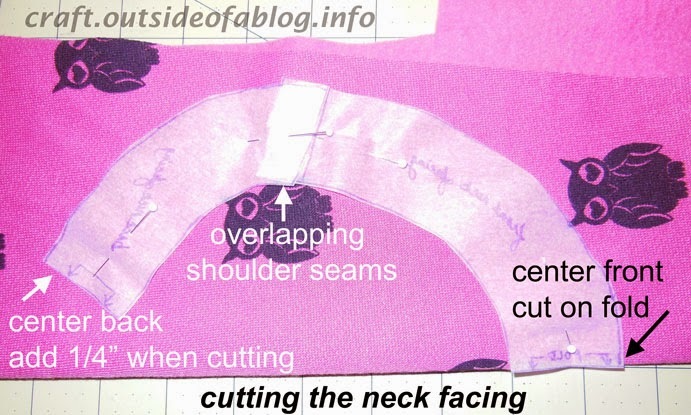 Pin your pattern to sustain the new hem edge, or trace a new pattern. To make a facing for the neckline, I marked points three inches from the neckline edge on the front and back pattern pieces, then traced a pattern: neckline, center front/back, 3-inch line, shoulder edge. Do retain your original seam allowances! After I created the facing patterns, I decided that since this fabric is bulky, I didn't want to add to the bulk at the shoulder seams. Instead I planned to have just one seam for the facing at the center back. I overlapped the two facing patterns at the shoulder line to eliminate the seam allowances (I know, I just told you to preserve them! Remember, you might want to sew this pattern again with a less bulky fabric and standard facings.) Then I pinned the joined pattern piece with the center front on the fold of the fabric. Remember that when you cut this out, you'll need to add a seam allowance to the center back. To apply the facing, match the facing center back seams, right sides together and sew with the seam allowance that you added at cutting time. I added 1/4 inch at cutting, so I sewed a 1/4 inch seam. Sew your tunic front and back together at the shoulder seams. Press all your seams. Place the facing on the tunic, right sides together, and stitch all around the neckline. Trim the seam allowance, if necessary. Turn the facing to the inside of the tunic and press. Stitch around the outer edge of the facing to hold it in place. If you don't like the look of the stitching, you could hand-sew the edge on the inside, or just stitch in the ditch at the shoulder seams to help hold the facings in place. Now, sew in the sleeves, sew up the side seams, and hem the sleeves and bottom of the tunic. 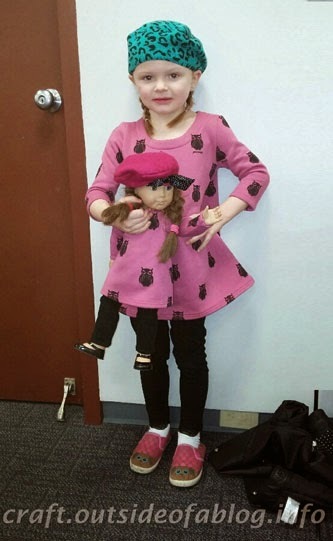 Matching dresses make a girl and her doll Sew Happy!